It was a spirited game and a see-saw battle in the holiday matinee game between our Blueshirts and the Gordon's fishsticks. Proving to be a contest that pivoted on power play opportunities and penalty calls, you have to give credit to both teams for trying to make their own luck every time a whistle blew, whether or not anyone had a clue as to what was called. Read the official recap here for the details. - The added scoring from our defensemen - It's in this light, that Tort's ideal for the defense really shine. They are shooting more on the power play and chipping in goals wherever possible. - Boogaard throwing the body around. It almost led to a goal yesterday and it's a presence that we have been missing the past few years except when the occasional player stepped up for a game or two. - Brian Boyle on face-offs. He seemed to pick up a little bit on using his size from that Messier center workshop and has worked to improve his game this summer. - Stepan continuing his hard work - there's a lot that can be said about this kid and his vision on the ice. His work around the net also shows another facet to his game that is the sign of a 'one day' elite player. He doesn't seem to be physically intimidated very easy and will push back if he needs to. The little scruff with Martinek yesterday did show that he could use some preparation for when the stuff really hits the fan. I was happy to see the first guy to jump in there and start throwing gloved punches on his behalf - and that was Gabby. Now that being said, is it too early to see some alarming trends...? - Second chances around the net. WTF?! We're practically gift wrapping them at this point. We can expect a lot of '5-goal against' games for Henrik if this continues. It was one of the reasons I was skeptical about cutting Exelby from camp that quickly. He was one of the few guys willing to make his presence felt around the net when guys crowded Henrik. 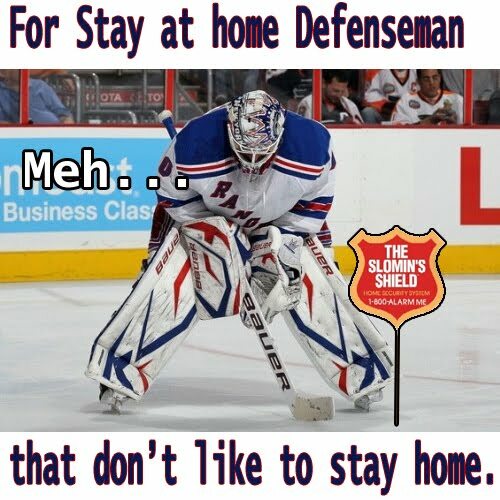 Of course it will be Henrik that has to pick up the slack if the D-Men don't and try to make spectacular saves without being taken off his feet. A feat that is a lot to ask of a butterfly goalie. When you have a good goalie, your opponents will inevitably resort to screening and picking up garbage around the net and it will pay to have someone who can hammer people in the crease. Which brings us to the next point. 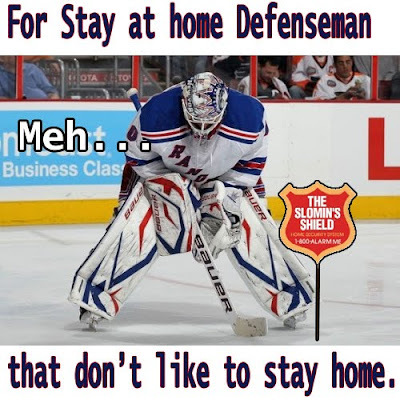 - Stay at home defensemen. Is there even such a thing anymore in the Bettman league? Its nice that our defensemen are chipping in on offense, but wasn't the whole point of jamming up camp with all these extra d-men tryouts, to find a defenseman that could defend? Staal has an edge to his game and doesn't seem to have any qualms about hammering someone as well as finding his offensive game because well, he can. Our other d-men are getting pucks to the net but play far too soft in their own end and have fallen into that trap of becoming the 4th forward rather than a defenseman. Quick to streak up ice and get caught deep in the opponents end; its going to present a lot of odd-man rushes this season and wear Henrik thin. Girardi, in particular, was supposed to be a stay at home defenseman and still strikes me as a little soft; a few season ago he was stepping into guys and playing them hard. Unfortunately, that all seemed to go out the window once he got punched in the mouth and driven into the ice by Cam Barker a few seasons ago. - The musical center game continues. Equipment problems aside, Torts has been plugging Stepan when possible and stirring up the other lines with Dubi and Christensen. It's still early and I am fine with exploring the options and trying to generate offense with click rather than a gel in desperate situations. Even still, times running out for Coach-a-rella as Drury and Prospal are getting antsy to play.. and something will have to be done eventually. Christensen may inevitable find himself the odd man out as he waits in the press box for Drury to break another bone or age to to further catch up to Prospal. Lets play these kids now with some consistency and find out what they can do before we stick them in 'Pressbox Limbo' and have to start the reintegration and assessment process every time we want to bring one back because of an injury. All in all, I expect at least one announced change in the line up before the home opener on Friday. How do you announce a team with a captain and an alternate on the DL? - Derek Boogaard - Can he please punch someone in the head already? I'm tired of seeing Boyle and Prust tangle with guys while he's out there searching for a dance partner and people avoid him? Its not his fault, mind you but.... Damn, punch someone already... even off the ice, I'd settle for watching him wail away on John Giannone... Actually, I'd kind of pay to see that. 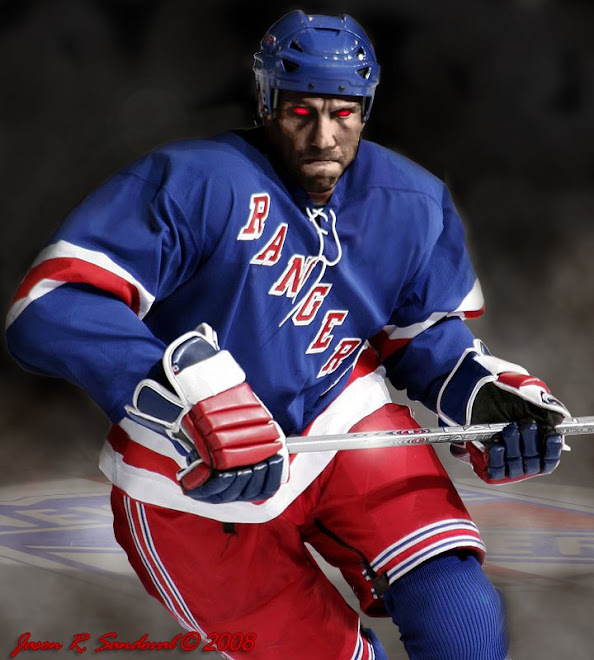 Till next time, Ranger Fans..
P.S. This isn't over Fishsticks! We're just getting started!!! Bah!